wow garcinia reviews can banana peel help you lose weight austin weight loss stassney watch extreme weight loss online free weight loss gujarati food Dennis Robbins Ph.D, M.P.H. 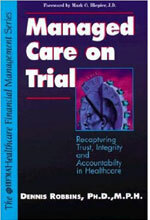 Managed Care on Trial explores the ethical and legal issues that arise from managed care and offers a prescription for the eroding confidence in the system by resorting trust, integrity and accountability. 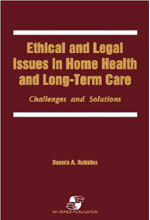 “Ethical and Legal Issues in Home Health and Long-Term Care” gives home health care providers practical approaches to the ethical and legal issues unique to home health care. 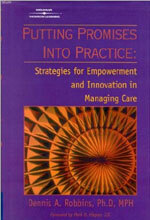 The author provide a sophisticated yet practical framework for developing and applying an ethics action plan. This comprehensive, up-to-date guide is based on the work of trendsetters in diverse areas of healthcare who have put their ideas into action and gives them a framework for sorting out the issues, and explores the current legal issues and their implications for managed healthcare. 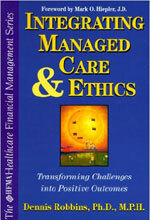 Over 500 chapters, articles, and reviews on ethics, health law, health policy, health innovation, person-centricity, and wellness.